Are you looking for new, creative ways to leverage the Olympics? Are you looking to promote Vitaminwater products on-site? Vitaminwater recently featured two (2) unique activation tactics in Vancouver as a means to leverage consumer passion for the 2010 Olympic Games and drive awareness amongst tourists and residents strolling through the city. As a brand within the Coca-Cola family, Vitaminwater launched a full campaign around the 2010 Vancouver Olympic Games that encouraged Canadian citizens, including Olympic athletes competing in the Games, to try its product. 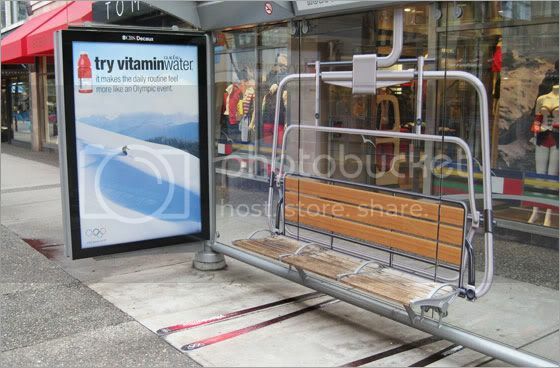 Vitaminwater teamed up with Cleveland-based ad agency Brokaw to transform Vancouver bus shelters into ski lift seating for consumers to enjoy while touring the city. The unique bus shelter branding was accompanied by signage that read, "It Makes the Daily Routine Feel More Like an Olympic Event", and the minor branding tactic really served as a great way to escape the Olympic clutter experienced throughout Vancouver.